Oh, you are not going to believe this. Great Wolf Lodge just called us to tell us they FOUND BUNNY AND BLANKEY after almost 2 weeks!!! What a blessing! Your site is also such a blessing to so many people. Keep up the great work! Recently my daughter’s irreplaceable “bunny and blankey” were left at a resort, and the housekeeping staff has been unable to locate them. She has had them since she was born and is 8 years old now. She is inconsolable and crying herself to sleep without them. 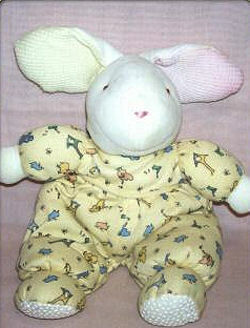 The bunny is from Carter’s and is white with light yellow pajamas with flowers. It has a rattle inside. The blankey is quilted, but flat, light green and white tones with pictures of bears and balloons and picnics on it. It is about 3×4 feet. Please help us find bunny and blankey. She is old enough to know if they are not hers, but maybe it will be some small comfort. Thanks for helping with the searches! I've passed the links along.